Premium Compatible Label Tapes for the Brother P-Touch 9500PC printer. 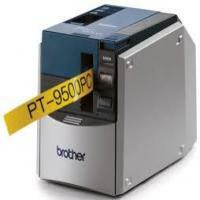 The Brother P-Touch 9500PC is a monochrome label printer that works on thermal transfer technology. This label printer is PC connectable. The Brother P-Touch 9500PC Label Tapes include TZ tapes up to 36mm wide and die-cut AV labels. The Brother P-Touch 9500PC label printer weighs 1.17 kgs and measures 4.6 x 5.0 x 7.5 inches. This label printer has a printing speed of 20 mm / sec and prints at a printing resolution of 360 dpi. The tape sizes it can print are 6mm, 9mm, 12mm, 18mm, 24mm and 36mm. This label printer can print in as many as 64 font styles. This label printer has 1379 built-in symbols for Windows and 870 built-in symbols for Mac. This label printer offers multiple copy printing and can print up to 5,000 copies. The Brother P-Touch 9500PC offers USB & Serial PC connectivity and USB Mac connectivity. This label printer has both hard disk space available and RAM memory available. This label printer has 70 MB hard disk space available for PC and 100 MB hard disk space available for Mac. This label printer offers 64 MB minimum RAM for PC and 24 MB minimum RAM for Mac. The Brother P-Touch 9500PC works on thermal transfer technology and is best for professional use especially for offices having high printing needs. Having a large number of print features, this label printer is very efficient. This label printer has a large amount of memory and does fast printing with a very high resolution. Since this printer uses Brother P-Touch 9500PC Label Tapes, therefore running costs are reduced. Q. What is the speed of the printer Brother P-Touch 9500PC and how many labels it can print? A. The Brother P-Touch 9500PC has a very fast printing speed, thus it can print with the speed of 20 mm / sec at a printing resolution of 360 dpi and can print up to 5,000 copies of the label. Q. Why should I opt for buying Brother P-Touch 9500PC printer? A. This label printer produces professional quality labels with ease. It can print labels for any electronic equipment and uses (white on clear), (black on clear) and (black on white) Brother P-Touch 9500PC Label Tapes for printing labels. The Printing speed is very good, and the printer can cut the tape completely well between each label. You cannot have the misalignment issues as the print quality of the labels is excellent. It is a great product and is highly recommended for creating professional looking, laminated labels from your desktop. Q. What is the use of collection tray and how can I install it? A. The collection tray is used to collect labels that are ejected from the PT-9500PC. One can use collection tray to print a lot of labels. Assemble the collection tray. One can refer the manual for the instructions to assemble the collection tray. Open the collection tray support. Install the collection tray to PT-9500PC. Further, refer to the illustrations from the manual to install the collection tray. Q. How to clean the Brother P-Touch 9500PC Label Tape? A. Use the TZ-CL6 cleaning tape with a tape width of 1 1/2" (36 mm) (sold separately) to clean the PT-9500PC easily. Press the cover release button and open the tape compartment cover. Remove the tape cassette and install the cleaning Brother P-Touch 9500PC Label Tape. Close the tape compartment cover. Press the feed or cut button. This will start the cleaning process. When the rollers stop, press the cover release button. Remove the cleaning tape, reinstall the tape cassette, and then close the tape compartment cover. For more details on the cleaning tape, refer to the instruction manual. Q. What should I do if the power button does not light up? A. This generally happens when the power supply cord is loose. Check that the power supply cord is connected correctly. If the power button still does not light up, contact the retail outlet where the PT-9500PC was purchased or any other authorized service center. Q. Why there is a requirement to clean the cutter? A. If the printed labels are not ejected from the PT-9500PC correctly, then there will be the requirement to clean the cutter. Press the cover release button and open the compartment cover. Use a cotton swab to clean the cutter. Reinstall the tape cassette, and then close the Brother P-Touch 9500PC Label Tape compartment cover. Note: Take special care not to touch the cutter when cleaning the PT-9500PC. Q. The message displays that appropriate cassette is not installed. What should I do? A. Check the following to identify the cause of the problem. Install the correct cassette into the machine and then click on the play to continue to print. Click on trash button to cancel the print job. Go to the Page Properties in the P-touch Editor and change the selection of the Brother P-Touch 9500PC Label Tape width so that it matches the one inside the machine. Try printing the label again. Q. While printing through Brother P-Touch 9500PC Label Tape, stripe appears. What does this indicate? A. The main cause of this is that the tape cassette is empty. Install a new tape cassette, and then either press the feed/cut button or turn the PT-9500PC printer off and on several times and then check the print results.